Please call our toll free number 800-523-0960 (US / Canada) and speak with a flooring associate directly to confirm style, color, quantity and shipping costs. To place a credit card order for floor care products please visit our online store. Stagestep Customer Service is available Monday through Friday from 9:00 am – 5:00 pm (Eastern Standard Time). 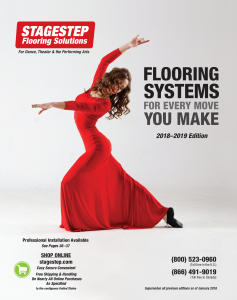 If you have a question or a problem with an order you placed or you have specific questions about our flooring and/or want a quote, please call or email a flooring sales associate directly.